I got a new office! I wasn’t supposed to get an office, but then my husband decided to paint our older son’s room in preparation for our possible move this summer (more on that when we get orders). After spending a few nights in the guest room (an old master suite), my son asked if he could stay. He’s only going to be with us until August—then he’s off to college, sniff, sniff—so we said yes. My old office was actually a corner of our oversized—thanks to the previous owners’ addition—master suite. Now instead of staring at my bed, clean laundry that needs folded, and the side of my neighbor’s house, I have a view of trees and the street through two windows, and a room all to myself. Not the ocean view I aspire to, but an improvement for sure. 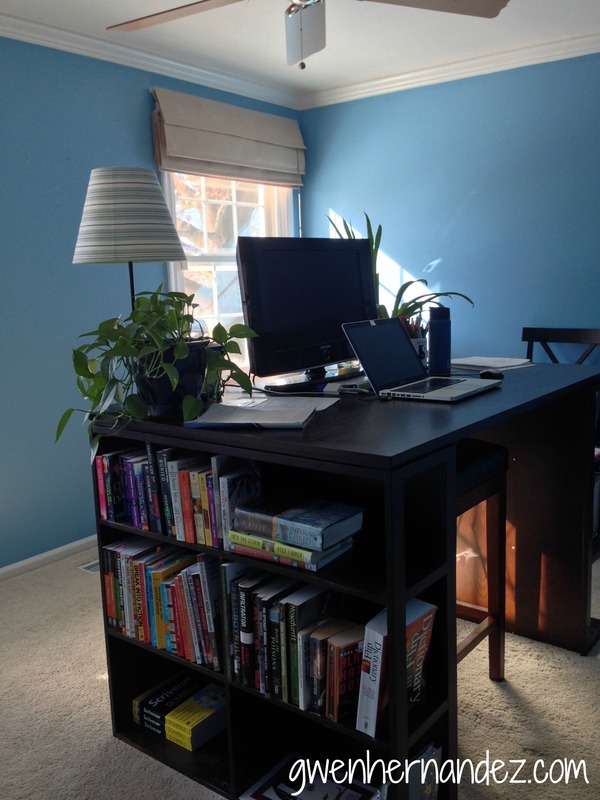 I love the blue color—good for creativity!—and the fact that I don’t have to worry about interruptions now that I’m not in a multi-purpose room. Plus, I used to sometimes avoid spending time at my desk because I was getting sick of working and sleeping in the same place. No more (unless you catch me napping on the carpet). Anyway, we’ll probably be downsizing and I may be back to sharing if we move this summer, but for now, I’m enjoying my new space. What would your ideal office look like? I just commandeered a room too. My window looks out at the Puget Sound and the Olympic mountains. I’m a little concerned I will be majorly distracted, though. I know – poor me! It’s good to get that dedicated space. themercerweave: Wow! That sounds like a fantastic view. I would choose to see it as inspiring rather than distracting. I like to have something calming and pleasant to look at. I think I need to find a good picture for the wall space between the windows… Yay on getting your own office space. I hope it leads to lots of productivity! CortlandWriter: That sounds great! Definitely inspiring. Is the picture on your blog from around your area? When I was in Montana I visited the house of a writer who had a loft office with a 365 degree view that included a nature preserve and the mountains. It was gorgeous. Gwen: No, the picture on my blog is actually taken from my wife’s brother’s house in Waynesville, NC. Ah, well, that’s pretty too. The pic on my blog is from Shell Beach, CA. Haven’t lived there in eight years (! ), but I love it. Well, I’m signed up for your Scrivener class next month, so I’ll get to test drive it! Glad you like your new office Gwen. Is blue really good for creativity or is that a subjective view? I get my hour a day in before the sun rises so the view is unimportant really. I don’t have an “office” more of a dedicated corner! Clive: I happen to love blue, but studies have shown that it’s better for creativity. Here’s an article on it from a few years ago: http://www.npr.org/templates/story/story.php?storyId=100301582. I take advantage of this to make my Scrivener full screen background red when I edit, and blue when I’m writing (or a soothing ocean photo).